Automatic operation of roller shutters generates real measurable benefis. Bubendorff roller shutters can be operated in a variety of ways and so they offer comfort,s avings and safety. 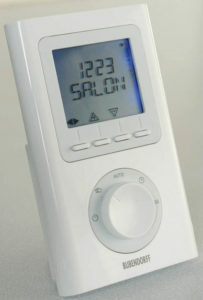 The basic operating devices are 1 or 5 channel remote controls. Roller shutters can also be programmed according to user preferences and open/close at a pre-set time using a control timer. Thank to cooperation with a weather station they can react to changing weather conditions, both inside and outside the house. Movable louvers roller shutters improve control of daylight by enabling you to adjust the angle of the louvers just as in outdoor blinds. Bubendorff roller shutters can be integrated with any „smart home”system and can be remotely controlled using devices such as a smartphone or a tablet. 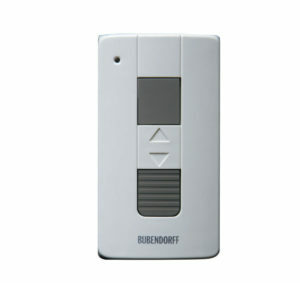 A 1 channel remote control for operating one roller shutter or one group of roller shutters. Included in standard eqipment of any roller shutter. A 5 channel roller shutter for operating groups of roller shutters (up to 5 groups). 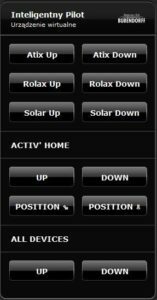 Can be used to set „scenes”. 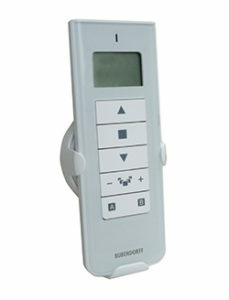 A Bubendorff time switch for automatic setting closing/opening cycles during the day. Bubendorff roller shutters can be integrated with any „smart home”system. They can be remotely controlled through a smartphone application.